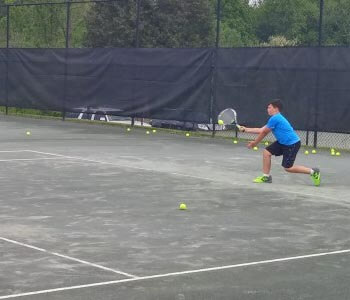 Wildwood Country Club offers first-class tennis facilities featuring four clay-courts and a Pro Shop. Maintained to ensure fair and competitive play, our courts overlook the golf course and provide ample parking. We employ a full-time Tennis Pro and offer private lessons and workshops that range from junior to adults for players of all skill levels. Pee Wee: Introduction to tennis focusing on activities and games that build hand-eye coordination and increase attention span. Primary goal is to excite student about the game of tennis and teach basic skills. Beginner/Advanced Beginner: Basic fundamentals of tennis are taught in a fun and learning atmosphere. All basic strokes are introduced, focusing on proper stroke mechanics and form. Intermediate: This clinic focuses on stroke mechanics, ball positioning, and begins to focus on basic game strategies. Competitive drills and games are used to build player consistency. Advanced Junior Development: This clinic is for novice to tournament level competitors. Drills and games focus on advanced game strategies, ball placement, and point construction. This clinic includes 1 hour of match play. Placement for this clinic must be approved by HEAD PRO prior to acceptance. Ryane is originally from Clearwater, Florida. She competed in Junior USTA tournaments for 10 years earning top rankings in the state along with several high school titles. After high school she competed at the collegiate level for the University of North Florida in Jacksonville. With over 15 years of teaching experience and over 25 years of competitive playing experience, she brings extensive knowledge to the sport of tennis. Currently she is the Head Tennis Pro at Wildwood Country Club and has been in that position for 7 years, she now is competing in Womens 5.0 USTA tennis and plays open level river-city league tennis. Ryane is USPTA certified, AFAA Group Fitness Certified, KHSAA Sports Certified, and also coaches Mercy Academy tennis team. She brings high-energy to the sport of tennis and strives for the growth of tennis through creative and motivating strategies.